The Classic Eternity Cremation Urn is made from cast brass with a polished finish. It features hand carved motifs and the perfect lacquer coat to preserve its brilliance. The timeless design of this urn will invoke the classic themes of humanity and help connect your precious memories to eternity. "Very pleased came quickly and is exactly what is described and pictured. Just a little sharp where pattern is etched." Chris E.
"Very pleased with the appearance and quality of this beautiful urn." 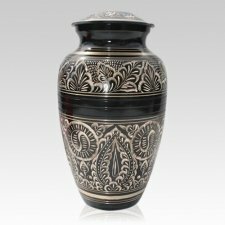 Carolyn C.
"The Classic Eternity Cremation urn is wonderful. I can't believe that this type of quality is available at the low price I paid for this urn. "We saw these same urns at the funeral home for more money!!! What a great deal we received with you..." Audrey S.
"I was surprised at the uniqueness and beauty of this item. "I was very pleased with this product, as I was looking through the website. I came across this item; I wanted something that I could have for my home and a beautiful resting place for my mom.